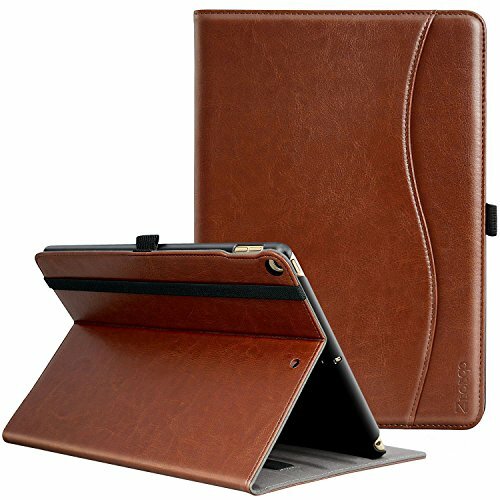 New IPad 9.7 Inch 2018/2017 Case, Ztotop Premium Leather Business Slim Folding Stand Folio Cover with Auto Wake/Sleep,Pencil Holder and Multiple Viewing Angles, Brown | Replicafer Co. Premium Graded Material - Excellent workmanship with premium synthetic leather exterior and soft microfiber interior lining. Multi-functional Features- Built in leather hand strap, pencil holder and organizer pocket. Auto Wake & Sleep Feature - Magnetic smart cover supports auto wake & sleep function. PLEASE NOTE - Exclusively designed for Apple new iPad 9.7-inch 2017 (5th Generation) and A10 2018 Education version (6thGeneration) precise cut-outs, will NOT FIT other iPad models. If you have any questions about this product by Ztotop, contact us by completing and submitting the form below. If you are looking for a specif part number, please include it with your message.